Sir Walter Scott (1771-1832) must be credited as the inventor of the historical novel. His best books are based around famous events of Scottish history a century or so before his lifetime: the Jacobite rising of 1745 (“Waverley”), the 1715 rising (“Rob Roy”), the persecution of the Covenanters (“Old Mortality”), the Porteous riot in Edinburgh (“The Heart of Midlothian”) and so forth. I don’t think he is read much these days, which is a pity. His defects as a novelist are obvious: most of his novels are slow to start and the plots are often very unconvincing - usually the rather dim and colourless young hero and heroine get into a dreadful mess, until some powerful and influential person has to intervene and sort things out for them; such as the Duke of Argyll in “The Heart of Midlothian” (In “The Bride of Lammemoor” no such saviour appears, so they die). But Scott’s great set-piece scenes are always fine, and his gallery of lesser Scottish characters is wonderful; clan warriors, peasants, witches, religious fanatics; always colourful, eccentric and sometimes half-mad. But there is more to Scott than this: he is largely responsible for the popular image of Scotland which is still prevalent today. For a hundred years, no British King had ever ventured north of Oxford, but in 1822 George IV decided to go on a Scottish jaunt. 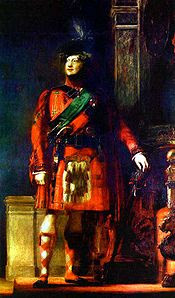 He was a great fan of Walter Scott’s novels, and he announced that when he visited Edinburgh, he would wear the kilt! It is difficult for us to comprehend how radical a step this was. For forty years after the Jacobite Rising of 1745, wearing Highland dress had been a criminal offence, punishable with imprisonment or deportation, and in the interim, most of the old tartan patterns had been forgotten. But time had softened the old fears, and, largely thanks to Walter Scott, the clothes which had once been the garb of the barbarian clansmen from the mountains who terrorised the Lowlanders (for of course no respectable citizen of Edinburgh or Glasgow ever wore a kilt), were now seen as something colourful, romantic and uniquely Scottish. Scott himself masterminded the excursion, and the surviving clan chiefs, who were now highly respectable gentlemen (and in many cases now vigorously evicting the surviving clansmen from their ancient dwellings in order to make way for sheep farming) now hastened to clothe themselves appropriately for the Prince’s visit. If their clan tartans had been forgotten, they instructed clothiers to invent something that looked right! Everything we now see as Scottish; the kilts, tartans, bagpipes and so forth, date from this time, and are largely attributable to Sir Walter Scott. 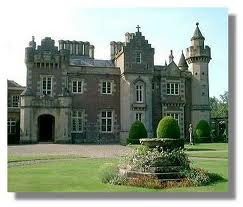 It was with this in mind that I visited Abbotsford, Scott’s house in his native Border country: a territory not of kilt-wearing clansmen, but a violent land of cattle-rustling, feuds and murder. (Amongst his other achievements, Scott was an avid collector of Border ballads, those magnificent traditional sagas of black deeds, and himself composed many poems in the same vein). The house is an impressive erection in the 19th century “baronial” style. “Do you remember the mice with the tartan ears? Because we sold the last of them to the French disabled, and I can’t remember who supplied them”. I had this vision of a stream of French people in wheelchairs, all gratefully clutching their tartan-eared mice. But I’m willing to bet the Walter Scott would have collected mice with tartan ears, if he thought they once belonged to Bonnie Prince Charlie!